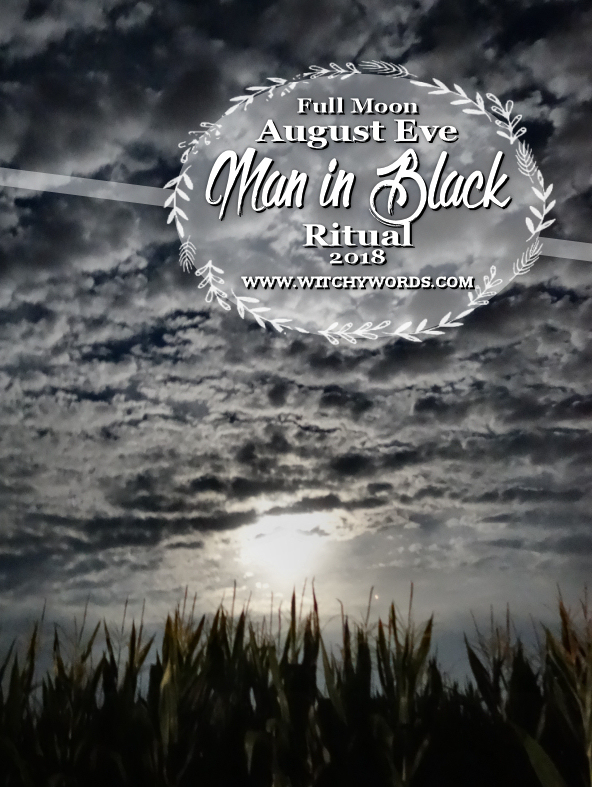 This post will cover my personal August Eve and full moon ritual performed on the full moon at the end of July: A dedication to the Man in Black. Just a few days before the full moon, I was driving home from work. My job often takes me to places far beyond the city's reach and this time was no different. 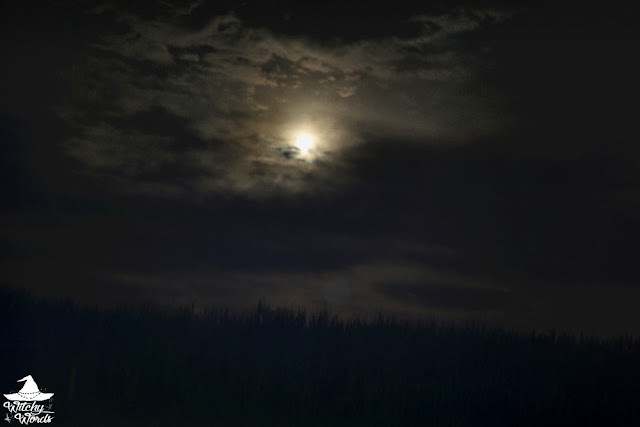 As I was traversing the winding back roads that would, with time, lead me to the main highways, I saw a shadow flash across my vision. I pulled my car over and put my warning lights on, yet no one passed my way. 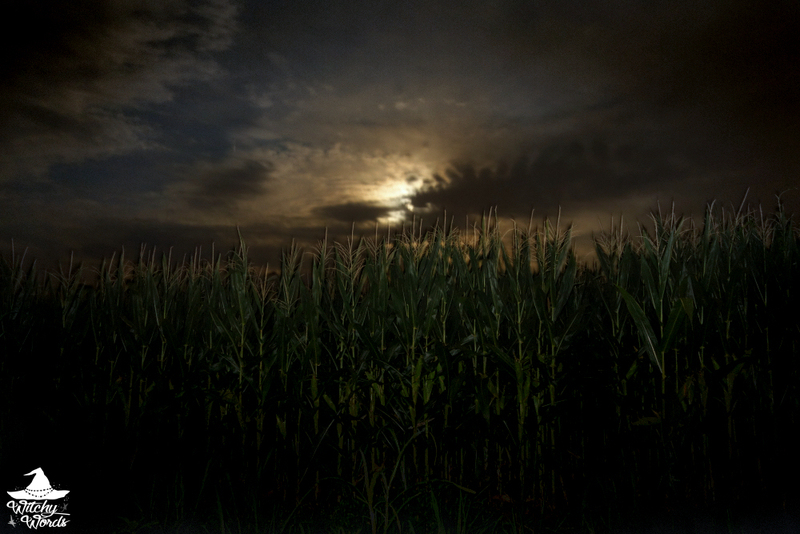 As I stared out across the vast cornfields before me, I felt the hair raise on the back of my neck and I knew: This was it. This was the spot. And it was indeed time. You may have noticed that my last two rituals for Circle of Fountains were extremely Trad Craft in nature. What is Trad Craft? 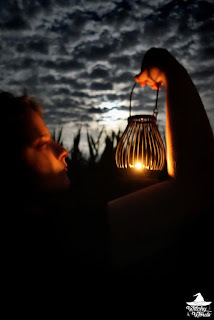 Traditional Witchcraft is hardly definable but many associate it with the lore and mythos circling the European Witch Trials along with folk magic of their area. In some sense, it's almost reconstructionist in nature, taking the confessions of supposed witches as the basis for the Craft and utilizing it to create a personalized form of magic and dedication. For Yule last year, I focused on the lore of the Wild Hunt. 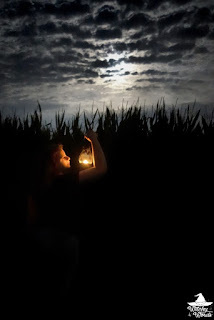 Back in May, I performed a Faery ritual. Both are relatively Trad Craft in nature. 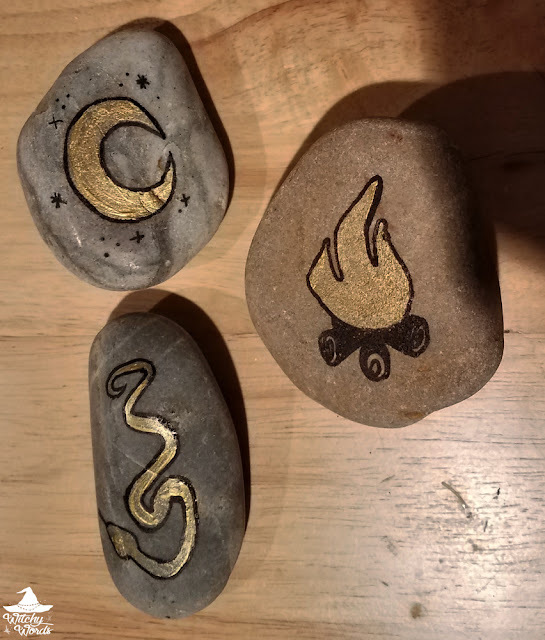 Part of my May Day Faery ritual involved circlemates selecting stones with symbols on them. I did not participate in this as I was leading the ritual myself. After everyone had gone, I collected the last three stones and... there it was. I had indeed been called that May, a sign that by moon and fire, my dedication would be done. 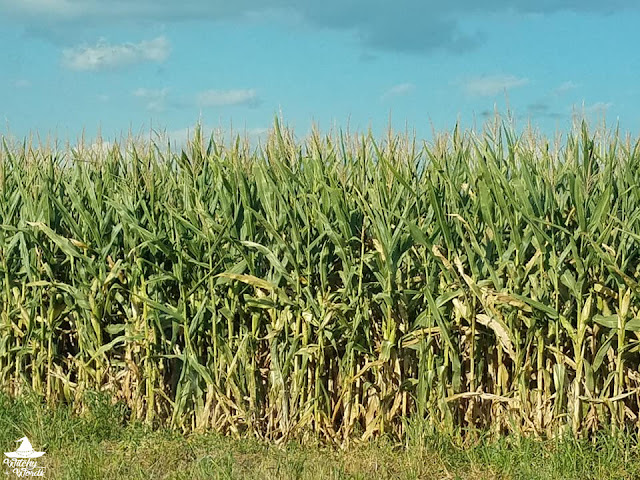 And, as I drove by this field just shortly before August Eve and the full blood moon of July, just feet away from a crossroads, I knew: This was where my dedication would occur. 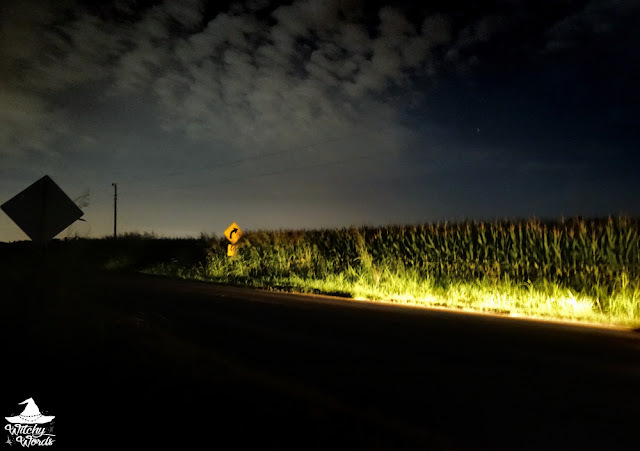 Upon the night of the Aquarian full moon, the night of the eclipse and six retrograde planets, I traveled back out of town of my own accord to this very spot. I parked my car deep within the grass and turned the lights off. Taking my box of supplies, I stepped into the road to the spot I saw before, the spot of my dedication. The spot of my rebirth. In the middle of the road, I drew with chalk a large circle. 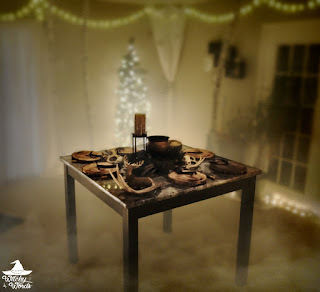 I then lit a candle within the center and paced the circle backwards three times, all the while undoing any hold any other entity may have ever laid claim to me. Then, reading from Gemma Gary's The Devil's Dozen, I called upon the Man in Black. 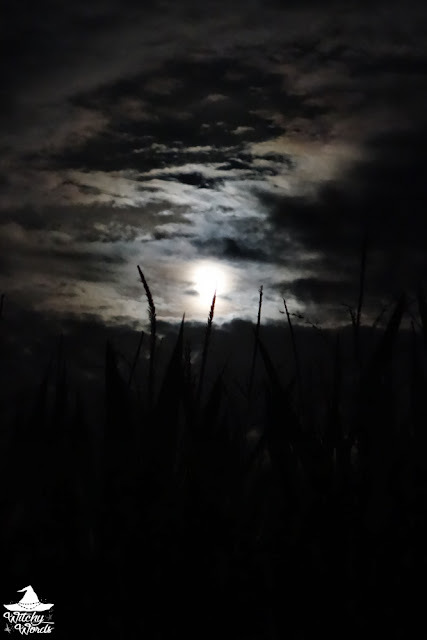 I stayed there, listening to the howl of a wolf in the distance during the surprisingly chilly summer evening. 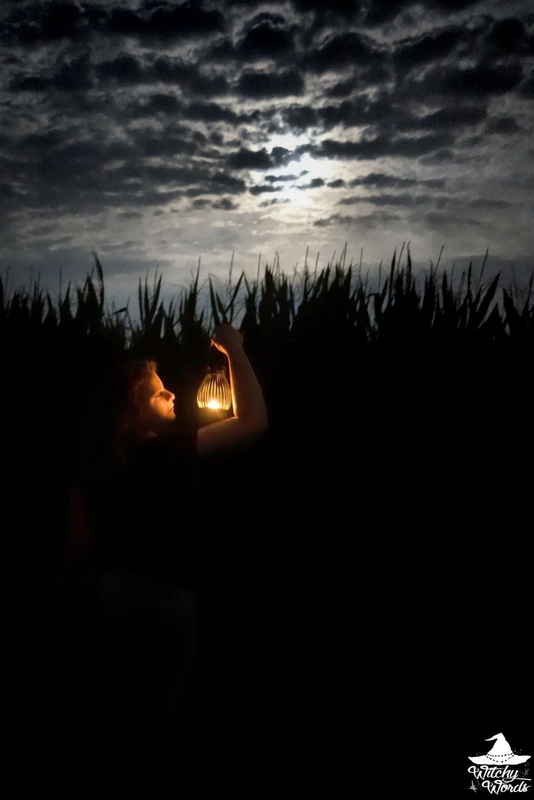 The candle waxed and waned, flickering. 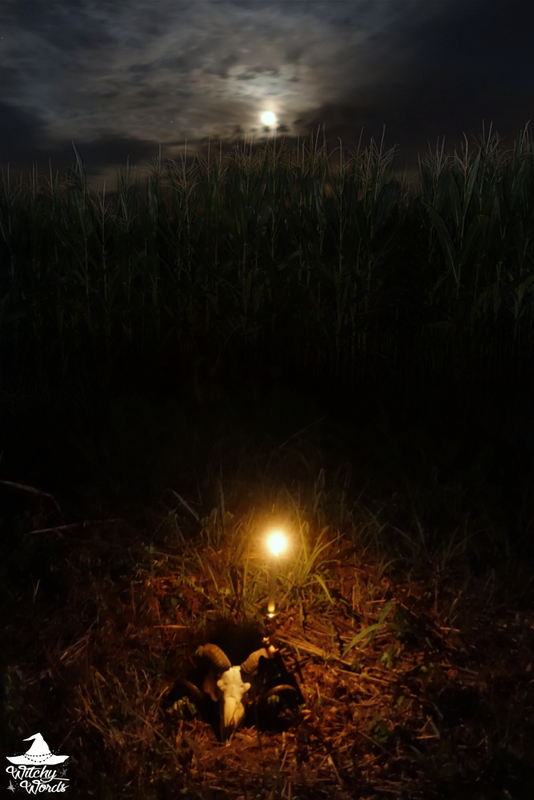 Then, my flashlight and the candle's flame both went out at the same time. What happened during that period is between me and the Witch Father alone. 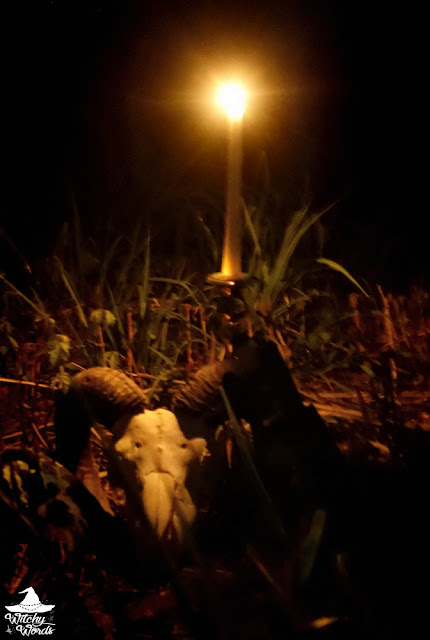 When my flashlight came back, I created a small altar to the Man in Black himself in front of the corn field, invoking his energy to the ram's skull that I could then take with me back home. With that, I was released from the ritual at hand. I said my thanks to the land and stretch of road, to the crossroads and the moon, to the corn and the gorgeous weather provided for my rite. I then turned my car back on, navigated back to the road and left my place of rebirth. Very interesting post and beautiful photos! I’m not sure exactly who the Witch Father is and couldn’t find much info online. Where do I find more? Best of luck on your new journey, I’m looking forward to hearing more about it! I also highly recommend Gemma Gary's The Devil's Dozen. This ritual was heavily based on her writing. 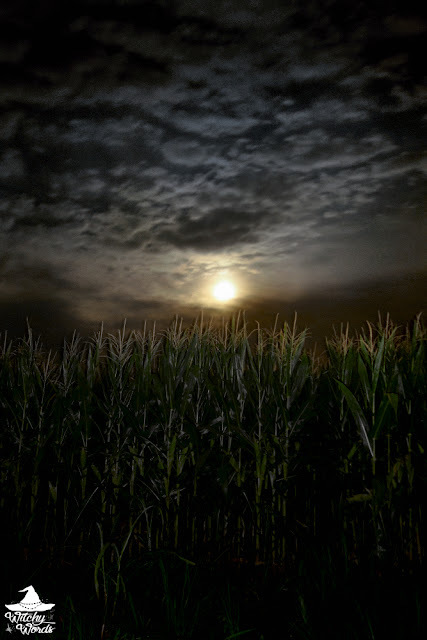 Blessings to you as you start down the Crooked Path! It sounds like the perfect ritual. Thank you so much! It truly was a special experience! That was so beautiful and touching. I'm looking forward to hearing more of your journey down the Crooked Path as well. I have really good feelings about what lies ahead for you. Thank you so much, Anon! I do too! This is my first comment as a reader, because this post was THAT refreshing and inspirational. I could almost feel the wind in your sails. Although- I own land and grow crops, and the live flame made me wince. I am also a lurker who loved this post!! I immediately picked up a copy of Devil's Dozen. I can't wait to hear more.